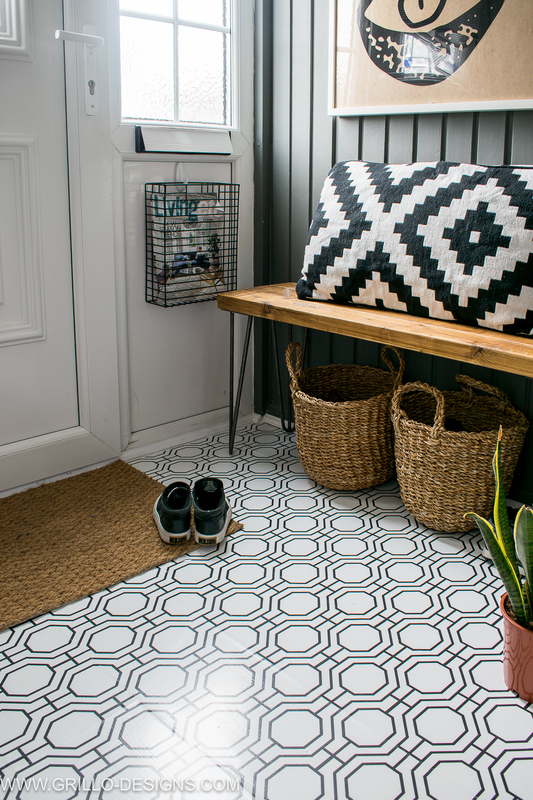 At the risk of sounding absolutely insane, and most likely causing the raising of an eyebrow (or two), I’m here to tell you today that it’s not a myth- you can indeed wallpaper a floor! Thanks to DesignYourWall.com for partnering with me on this project. Renting as a concept, is great. It gives you the freedom to live wherever you choose (within your means), you dont have to worry about the cost of general house maintenance and it’s also much cheaper (and easier) to get on the renter ladder than it is the property one.. yada yada (I could go on, except this is a post for another day…) . There is however, one slightly annoying clause to renting though… and that is the in-ability to decorate how you want. It might feel like your home, but you dont ‘own’ it. 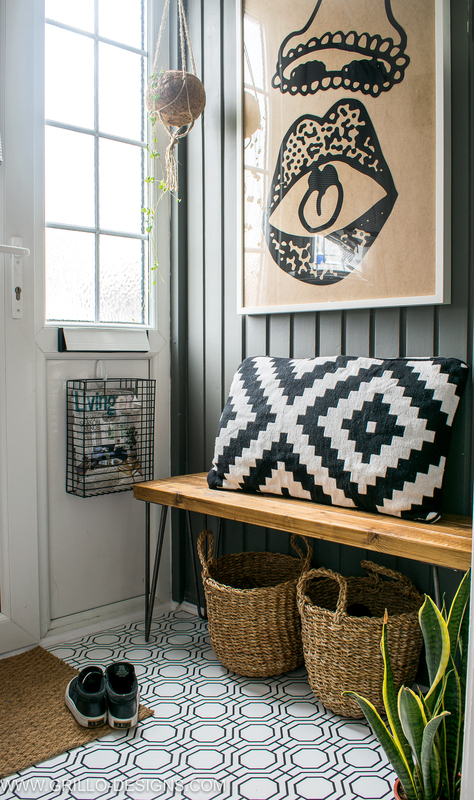 Paint a dark feature wall … know you’ll have to paint it back. Hang a picture… holes will need to be filled in. Re-tile the bathroom … that’s a crazy idea, let’s not carried away now! 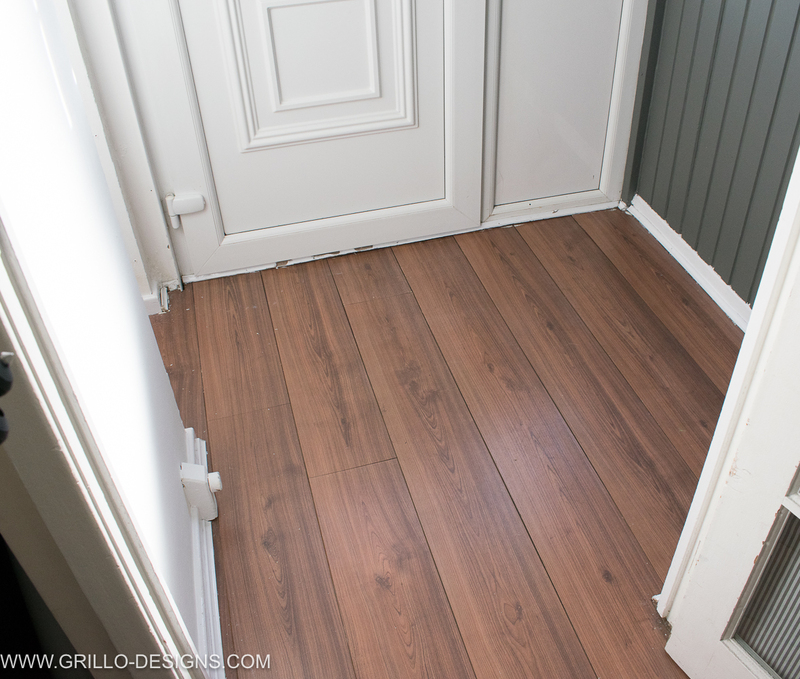 New flooring just coz… erm that’s a big no! Or rather, kind of pointless. 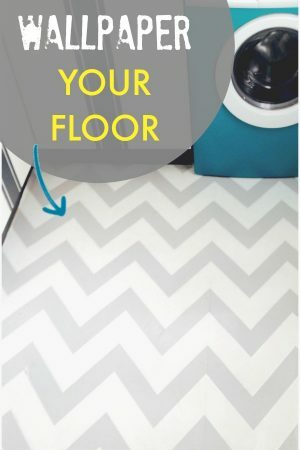 I mean I’m sure there are landlords out there who will be thrilled at the thought of you shelling out on new flooring, as you are essentially adding value to their house , but realistically speaking, unless you’re earning quite a few dosh (and if you are, put that money into saving for your own house!) it’s kind of out of the question . FIY I’m not talking at you by the way, I’m talking about myself here. Yes I’m the crazy girl who wanted to change her flooring. So.. guess what? I decided I would wallpaper it. Yup you heard right. Wallpaper it! And it’s not the first time either. 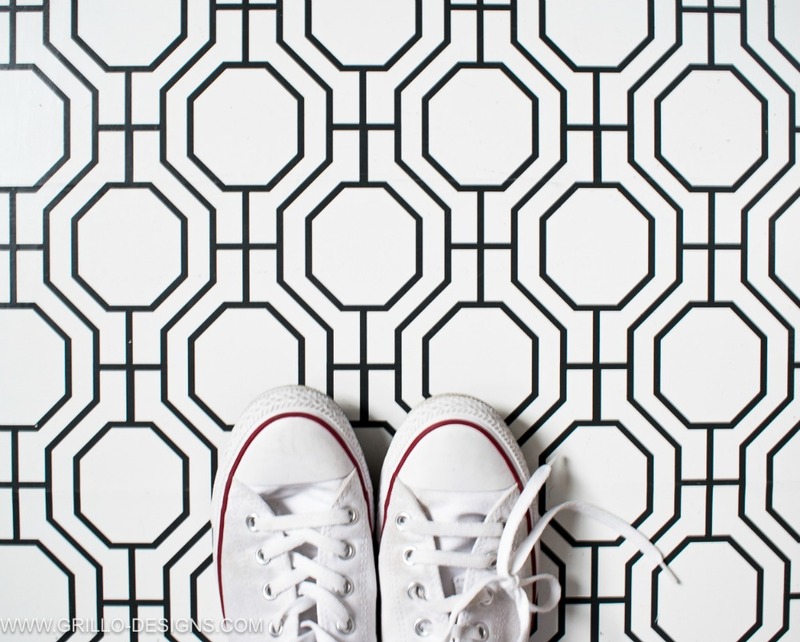 A few years back I did the same thing to my rather ugly kitchen linoleum floor – and loved it! I’ve since moved from that house ( I can tell you now it was a total breeze to pull up), and I’ve been itching to try it again! Just about the same time I was turning over wallpaper sources in my head, I was approached by a Wallpaper company based in Los Angeles, called DesignYourWall.com. 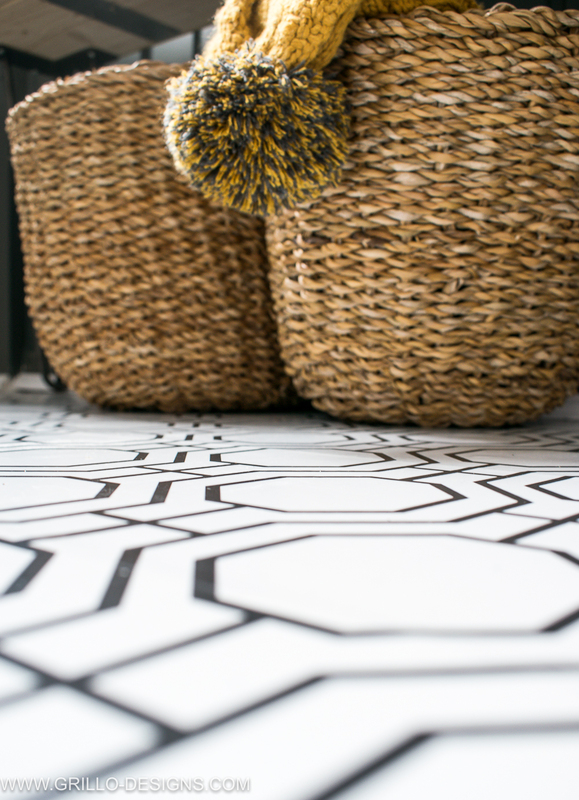 I liked that they had in-house designers for a more customised approach and together we worked to create a gorgeous print for my floor. I wouldn’t really advice large spaces for this concept. The smaller the better i.e. Utility room, toilet, bathroom, porch (foyer)etc. 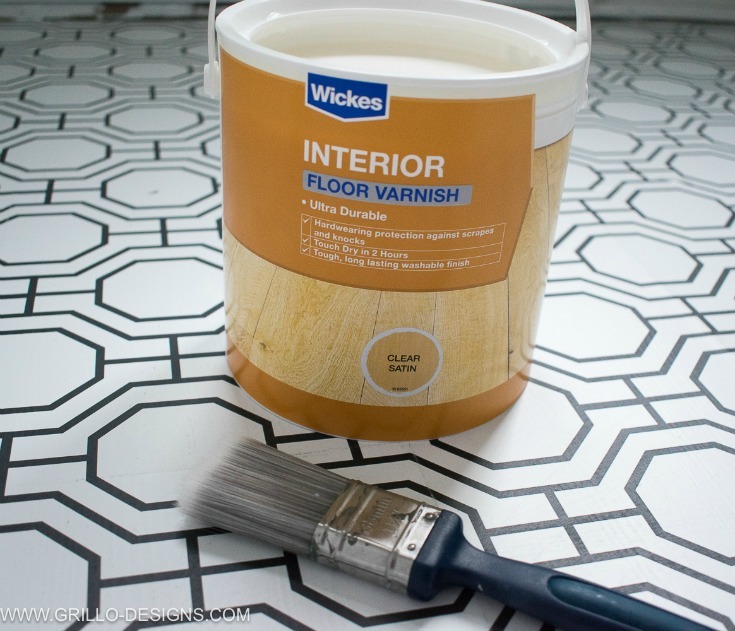 Ensure the flooring surface is flat and smooth before applying the wallpaper covering i.e fill in any imperfections with wood filler or sand if needed. I think that’s it.. so lets get down to the nitty gritty! And here are all the steps! 3. 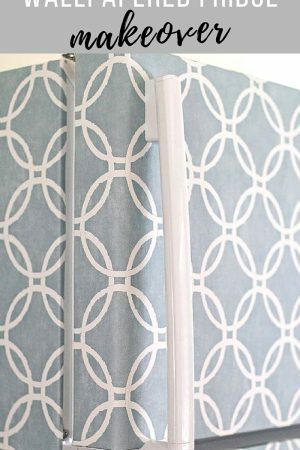 Peel back the backing of the wallpaper bit by bit and line it up against the edge of your floor. Use the other hand to smooth out the paper with the card as you go. If you find air bubbles appear just lift the contact paper back up and smooth it out again. 4. 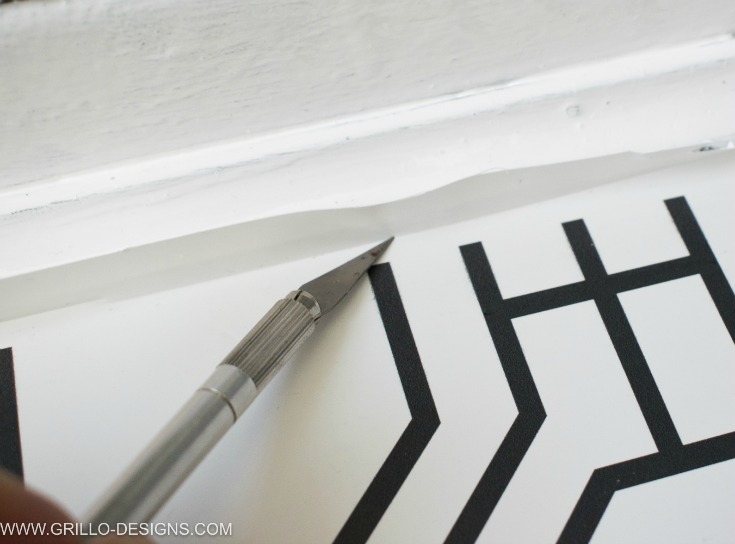 Once the paper is in place, use an xacto knife and/or scissors to remove excess wallpaper and neaten up the corners and edges. 5. 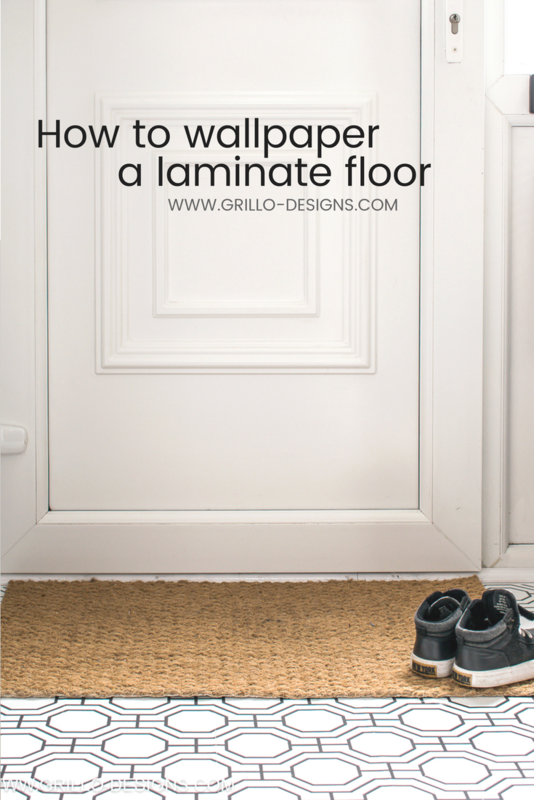 Optional: Give the floor a light sanding with 220 – 280 fine sandpaper. 6. Vacuum up at any residue/dust. 7. Finally the floor needs to be sealed. Open a can of clear polyurethane and stir well. For best results, use a floor pad ( I used a paint brush) and apply it to the floor with long, even strokes. Let the floor dry for approximately four hours between coats. You need at least 3 coats for a good seal. Make sure to leave the floor for at least 48hr to cure before moving in furniture. If in doubt, follow the instructions on the back of the can! Furniture in – including the bench I made earlier this year and done! Didn’t I tell you it was super easy!! 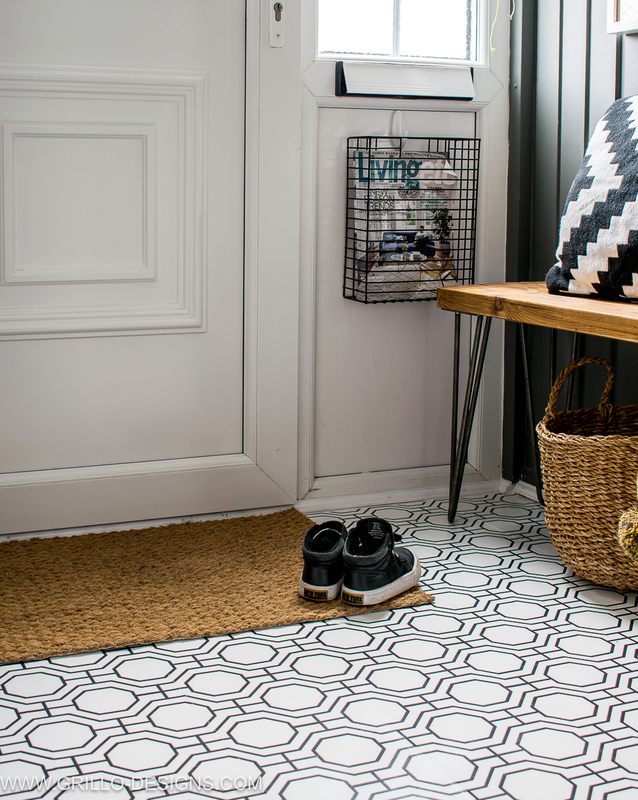 Here are some more pretty after shots of this entrance makeover. I’ll be writing another post in a few days with a few more pictures and sources for some of the decor I used, so watch this space! This is brilliant! 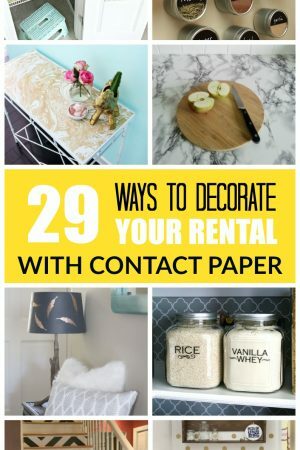 It looks great, and I’m inspired to try my own renters contact paper diy in my kitchen. Thanks for the post! How long will it last? Want to wallpaper my bathroom floor. So far its been down almost a year next month! Love, love, love it Medina! And great tutorial by the way. I’m super anxious to see how it hold us to foot traffic. How did it do at your other place? Thanks for the diy! I LOVE LOVE LOVE LOVE this idea!!!! Thank you for sharing!! Ahh I’m so glad you like it! So amazing that the land lord gave you permission. Looks gorgeous. This looks great, thanks for a very clear & detailed write up. Do you have any idea how long it lasts and/or how easy it is to get off? Hi Lo. When you remove it you will need to apply heat (so use a hair dryer) and then you will need to remove the sticky residue so you can use a steamer or other products for this. With regards to how long this lasts, Ill keep you updated! Just wondering, is sticky back Vinyl just normal vinyl that you’d find in flooring stores/online? I hate my bathroom vinyl, so Im looking to replace it. But the sticky vinyls I’m looking at look thicker than the paper you’ve used. Hi Murcilla. To be honest not really. I think what you are referring to is linoleum flooring . What I’m referring to is a fablon type material and is quite thin. Lino is great but the don’t have a lot of variety in styles. Also maybe a lot more expensive than fablon. Very nice and economical makeover… tfs! I absolutely love this idea. 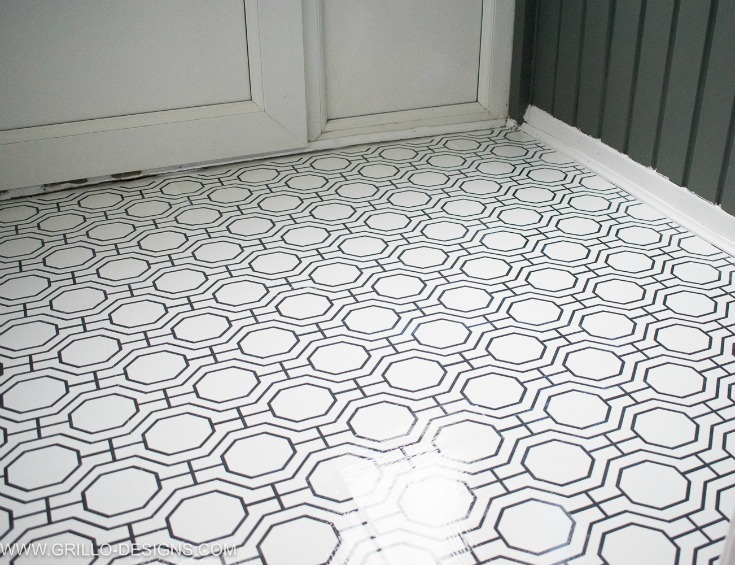 I’m not a fan usually of geometric designs but you may have just converted me, that floor looks fantastic. Ahh thanks so much. Im really glad you like it! Wallpaper a floor? Huh, I never thought about it before, but it does sound like a great idea. Love the post! Thank you for sharing at The Creative Circle link party! 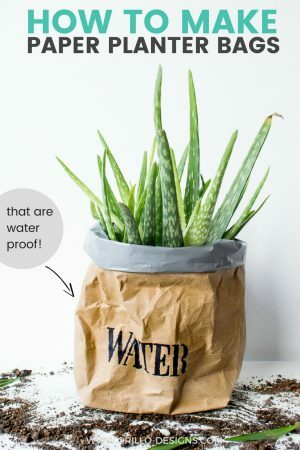 This fantastic DIY is my featured pick this week. 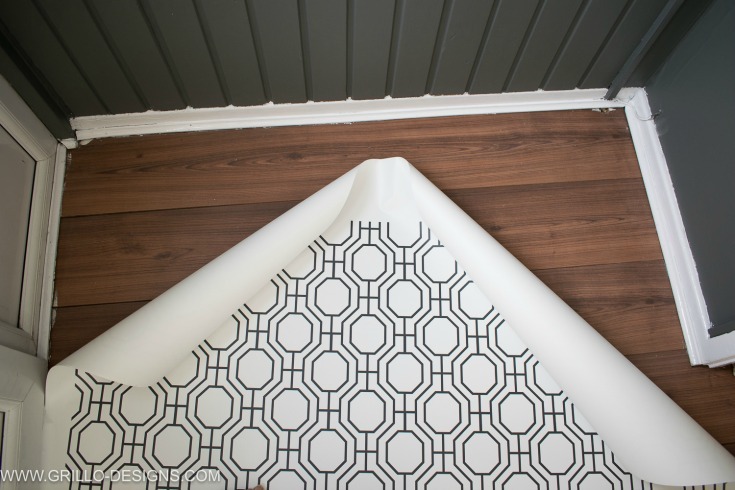 I mean I would’ve never thought of wallpapering the floor, just brilliant. Stop by and check it out! Oh I love it! That pattern is amazing and really brightens up that room. Would never have thought about doing this! This is THE coolest thing I think I have seen in a long time. It is such a great idea to create a space that feels like your own which can be hard to do when you are renting. Brilliant idea!! 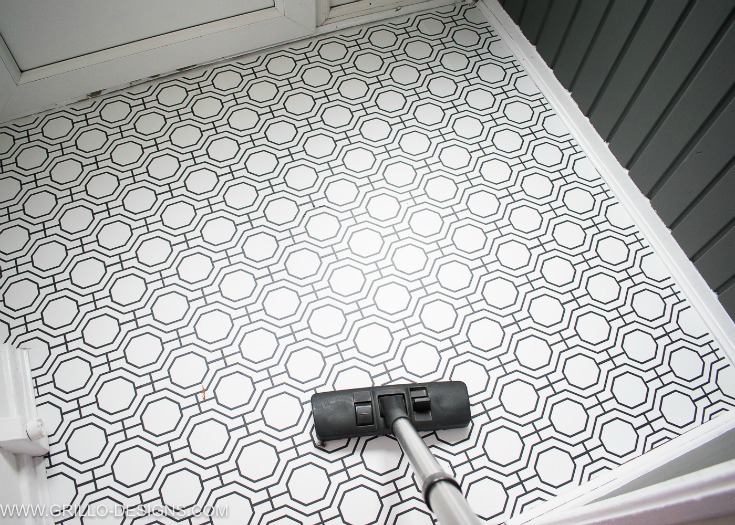 I can’t get over how effective that looks – as a renter in London, I know the pain of ugly floors etc. Very inspiring!! Thanks for this! You never cease to amaze me! 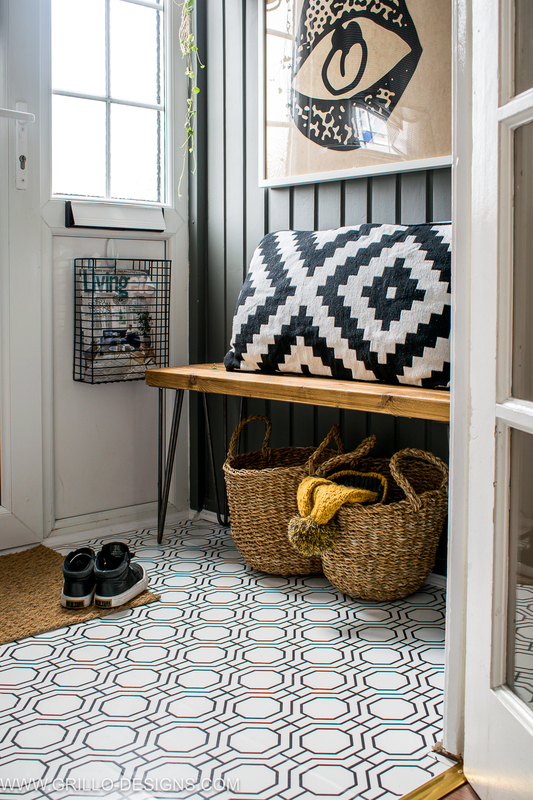 It looks fabulous and is such a bright update for your entryway. I’m sure pulling it up will be a breeze, and you’re smart not to spend your hard earned money upgrading someone else’s property. 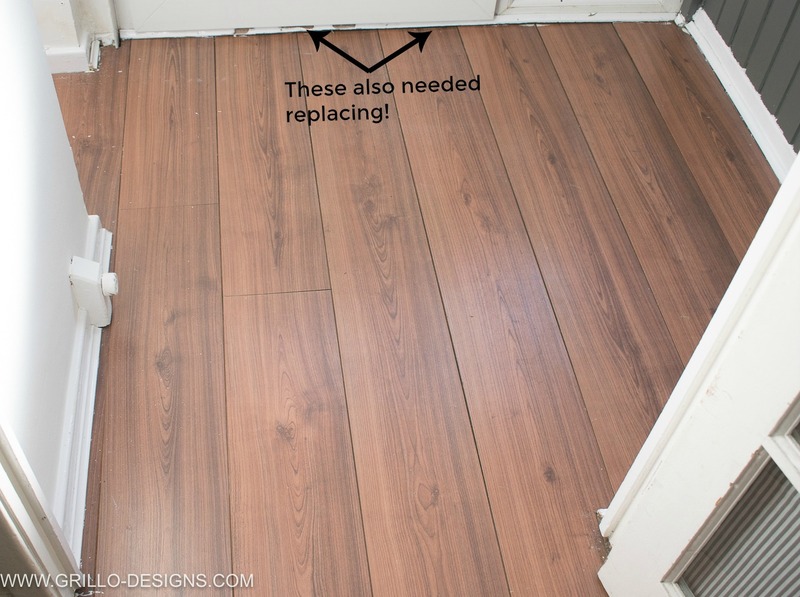 This is a solution that I’m sure many renters will be jumping at to try. Beautiful! I love the wallpaper you have chosen Medina, your floor looks gorgeous. I’m going to have to try this one day, the trouble is I know I won’t be able to decide on a wallpaper. Ahh thanks so much. With this idea, the sky really is the limit!